*** The CRA (non-refundable) is a guide to help you obtain repair estimates from certified stucco repair contractors. There is no dollar/estimate figures included in the CRA. It takes a MoistureFree Certified expert to inspect and repair your stucco home, but you don’t have to be an expert to understand most of the stucco moisture problems that occur on your home. 1. The inspection (not included) is reviewed by one of our specialists. MWC will produce a Certified Repair Analysis (CRA) non-refundable that outlines exactly what will be needed to qualify the home for warranty coverage and to guide you through the repair process. This review process is available to all and does not require a warranty purchase. Many people simply wish to know the extent of repairs needed to properly remediate their home. If you are purchasing a Certified Repair Analysis (non-refundable) we will review an inspection report (not included) sent to us from a MWC certified stucco inspector. Please email your report to reports@moisturewarranty.com . 2. At your request Moisture Warranty will send a copy of the CRA to several Certified Stucco Repair Contractors for their estimates on the repairs. This will help you with your decision on which company to choose for your repairs. 3. Or Moisture Warranty will provide you with a list of certified stucco contractors in your area who are familiar with MWC repair protocols and standards. 4. Once the repairs are completed an inspector must visit the home and verify repairs have been made effectively and according to MWC standards. Once these requirements are completed the warranty authorization can be issued and the $200 non-refundable review fee will be applied toward your warranty purchase. If you are purchasing a Certified Repair Analysis we will review an inspection report sent to us from a MWC Certified Stucco Inspector. Please email your report to reports@moisturewarranty.com . If no repairs are needed at that time the warranty authorization can be issued immediately and the $200.00 non-refundable review fee will be applied toward your warranty purchase. If the inspection report indicates that repairs are needed to the property the following steps will be required before a warranty authorization can be issued on the property. It takes a MoistureFree Certified expert to inspect and repair your stucco home, but you don’t have to be an expert to understand most of the stucco moisture problems that occur on your home. This guide is intended to help you understand the most common exterior moisture problems. 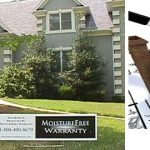 Remember, you can always call the experts at MoistureFree Warranty to help you with any of your home’s moisture problems. Our goal is the same as yours…a dry home! *** The CRA is a guide to help you obtain repair estimates from certified stucco repair contractors. There is no dollar/estimate figures included in the CRA.